Lancer Kessa Rychlick makes an attempt in the high jump at the Cal State LA Invitational March 3, photo by Richard Quinton. Freshman Alexandria Constanzo performed the state’s 16th best mark in the pole vault at the Cerritos Opener meet held Feb. 23. Constanzo’s vault of 9-feet, 6.25 inches allowed her to tie for seventh. She finished sixth in the pole vault on Mar 3 at the Cal State Los Angeles Invitational but at 9-3. Constanzo also was 15th in the long jump, a modest 13-5 at the CSULA meet. 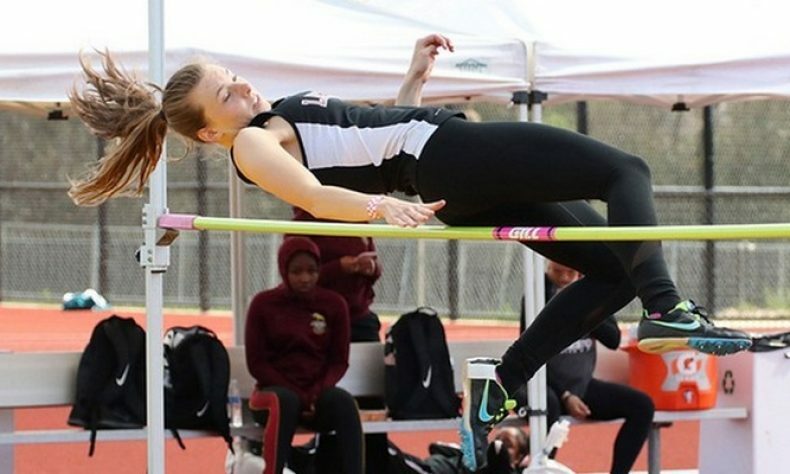 First-year athlete Kessa Rychlick was ninth in the 100-meter hurdles (18.56 seconds) and 21st overall in the 200-meter dash in 27.35 (29th in the state). Rychlick was fifth in the high jump at Cerritos with a leap of 4-feet-7, currently 27th in the state. She placed 11th in the 400 meters, winning her heat in 1:03.85. At Cal State LA, Julia Reyes ran 16th overall in the 1,500 meters (5:45.96) and 18th in the 800 meters (2:49.65).